The officers of Vol State Winnies wish all a Merry Christmas and Happy New Year. Many of you have already or are preparing to wander to warmer climates, while others have winterized their RV awaiting the springs return. We hope you all have had an enjoyable 2018 and are planning and looking forward to a fruitful 2019. This is the big year for VSW again with the biennial State Rally scheduled for October 17-20, 2019 at the Wilson County Fairgrounds AG Center in Lebanon, TN. Three nights entertainment have been scheduled with pre-rally trips., vendors and workshops being worked on. With the theme on Tennessee Music, we are planning on optional tours to Nashville as well as more local tours around Lebanon to include the Nissan Auto Plant tour. The Nissan tour is always a highlight of our members who haven’t been there and to the other state members who attend. We’d love to have as many of our new members and others that haven't been able to attend our campouts to attend our April 2019 campout in Lebanon this year so we all can become better acquainted, help solve one another's concerns and share thoughts on enjoying the RV lifestyle. For those planning to attend the GNR in Forest City Iowa in July, we plan to get together at the April campout in Lebanon to discuss what extra activities all would appreciate to include in pre-GNR and during GNR. To assist in your planning, occasionally check the WIT web site www.witclub.com and the VSW web site www.tnvolstatewinnies.org for status of different events taking place at WIT, VSW and the TN chapters. WEBMASTER—Keith Mobley continues improving the TN website to include a members only section. It has been and is a work in progress and goes along with WIT moving in the directions of more timely electronic information and less of the less timely printed information. All recommendations and likes/dislikes are always welcome. We want it to serve your and the clubs/chapters purposes. It is surprising how many non members and potential members search the web for information that often is not available to them otherwise. The webmaster has offered an option to ease the preparation of a newsletter for the state and chapters. Simply email your rough drafts and he will format and insert them into the website. Then an email to your members to let them know your newsletter has been posted on the website completes the process. Hope to see many of you at one or more of our activities this year. ​Don’’t be afraid to volunteer for one of the officer positions. Some states have a separate rally master from the President. I understand that VSW has done this on occasion in the past. assist in various aspects of the developing and conducting the rally. ​​Ralph asked me to assume the role of webmaster for our VSW website. In case you do not know, VSW has a web-site, http://tnvolstatewinnies.org that was create in 2017 (it was originally setup by Dennis Graham as tnvolstatewinnies@weebly.com when he was president of VSW) to boost attendance for our 2017 State Rally. Since the website was reestablished in June 2017, we have had 6,514 unique visitors and the number is increasing. In the past 90 days, there have been 1,331 unique visitors. So, there are potential members or those who would like to join us for outings or rallies using our website to keep abreast of our events. The website has been completely upgraded and now includes sites for each of our Chapters as well as VSW. It is easy to use—simply follow the orange hyperlinks to navigate its contents. We are also setting up a “Members Only” section of the website that will contain Club and Chapter information that will be for members only. On the web-site’s home page is a hyperlink, “For VSW Members Only”. When you click on the link, it will ask for you to create your own unique​ password. Once you enter the password, you will have access to all private information. If you encounter a problem, let me know. At last year's October campout some members saw a brochure advertising this tour. 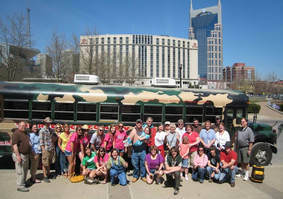 This is a “Redneck certified” two hour fun filled tour of Nashville’s most famous and historic sites (about 15 minute off bus restroom/snack break midway in tour). The tour departs from the Nashville Palace, 2611 McGavock Pike (AKA Music Valley Dr.) with free parking behind the Nashville Palace. To reserve this tour for our April Campout, we must make reservations with full payment before April 8, 2019. So we need to know how many are interested in the tour as soon as possible. If there are 12 or more then group rate is $30.00/ person plus tax. For more information about the tour and plans for our April 24 - 28 Campout, follow the link below. Mail your check to: Ralph Wiggers, 172 Hawthorn Loop, Crossville, TN 38555. Checks must be received no later than April 7th. At the request of members, we have also added links to newly created Facebook, Twitter and G+ webpages. A hyperlink located on the right margin of the home page will take you to any of these social media sites. We have used Tennessee Vol State Winnies for all of the social media sites so you now have your choice of communication networks keep in touch with other members. Our new digital footprint provides a great opportunity for us to keep in touch, always know what is happening in our club and chapters, and increase our visibility within the WIT community. But, it means that you must include http://tnvolstatewinnies.org and our social media sites in your schedule. Get in the habit of checking these sites on a regular basic. If you have any questions, send me an email—you can do it directly from the website—or give me a call at 865-207-5640.